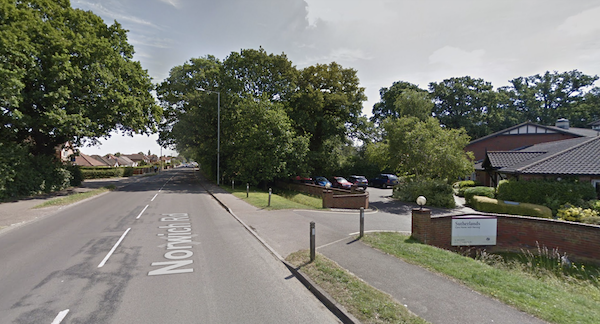 The claimant was riding his motorcycle West on the Norwich Road towards the town of Wymondham. The motorcyclist proceeded to overtake a double-decker bus ahead of him that was just moving away from a bus stop. Although it was a 30mph zone, the motorcyclist's speed was deemed to be in excess of 69mph.The claimant continued to travel in the opposing carriageway for some time after the overtake. The defendant was driving their vehicle in the opposing direction and was searching for the entrance for Sutherlands Care Home. Having located the entrance, the defendant proceeded to turn right and crossed the white lines. At exactly the same time, the claimant was returning back into their carriageway and upon seeing the defendant crossing his path, was forced to brake heavily. Tyre marks track the motorcyclist crossing the carriageway diagonally and colliding into the front offside of the defendant's vehicle. The claimant was thrown from their motorcycle into two parked vehicles. In determining liability between the parties, the Judge referenced numerous cases where visibility of the motorcyclist was clear and the other party was deemed liable for failing to see them. In this case, the oncoming claimant was visible to the defendant had they taken a second look before turning. Therefore, primary liability was established because of the defendant’s failure to look and see the claimant. Regarding contributory negligence, the claimant was to blame for the accident because of their excessive speed and riding in the wrong lane. These factors contributed to the accident taking place. In calculating the deduction of the claimant’s claim, the Judge again referenced previous cases of motorcyclists speeding excessively. Since the claimant was not hidden from the defendant but still riding at a speed significantly faster than noted in other cases, the Judge reduced the claimant’s compensation by two-thirds.